4.1 out of 5 based on 78 bloggers and 5 commenters. 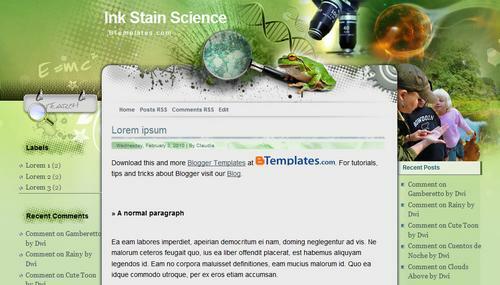 Ink Stain Science is a free blogger template adapted from WordPress with 3 columns, left and right sidebars and rounded corners. Excellent template for blogs about animals, education, people or science. Passei a usar esse tema em meu blog, mais depois de alguns dias ele não funcionava mais, tentei instalá-lo novamente mais nada deu certo.. o que posso fazer?? vocês podem tentar verificar esse problema??!! I too had this as my theme on my blog and now it is no longer working. I have tried reinstalling it several times. still not working. Very sad. It was a nice template and very fitting for my blog. I gave full credit where it was due too. Hope the issue can be solved ASAP. I have exactly the same problems with this template. I have tried reinstalling it several times, but still not working. Please, could you tell me the solution. Thank yoo.